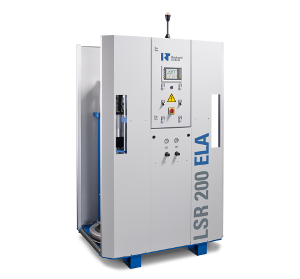 The LSR 200 ELA and LSR 20 ELA represent the latest generation of 1:1 mixing and metering plants for Liquid Silicone Rubber. This product line comes with top-notch features which provide great operator comfort, higher efficiency and significant cost savings. The individual smart control of the servo driven metering pumps enables a simultaneous unloading of both drums. In combination with the optimal platen design and a pneumatic drum bottom support, the LSR ELAs provide a maximum material utilization of more than 99.5%. In other words, the residual quantity in the both empty drums is less than 0.5%, this represents an additional material saving of approximately 50% compared to other electrical driven dosing pumps or even 90% of conventional pumps. LSR 20 LC: Pneumatic Drive Motor for reduced output 20L pail feeder for economic and compact meter mix Plant for LSR processing. LSR Conti Mix 200: High output for the production of bulky LSR work pieces. Drum lifter: Comfortable and easy handling of 200L drums. Drum Support: Helps to save additional 50% of residual material.